Spectrum Business makes it easy to keep all of your employees connected with reliable business phone services and solutions that include, free Unlimited local and long distance calling and over 30 advanced business calling features. You know how much your business relies on your Internet access—and a reliable, fast connection. Spectrum Business has the high-speed connectivity to increase your productivity, with support you can count on 24/7—for a solution that gives your business the edge. Seamless collaboration across locations starts with a consistent and reliable Ethernet connection. Our high capacity Ethernet solutions deliver secure and predictable Wide Area Network connectivity to keep your business running at enterprise speed. With Spectrum Business TV, you get reliable, high-quality picture and sound. Plus, you'll have over 45+ HD channels and multiple programming options so you can provide employees and customers the right channels for your business needs. Choose the communication services you need to excel, without spending more than you want. With our flexible packaging options, you will find reliable service and valuable tools built right into your customized package. 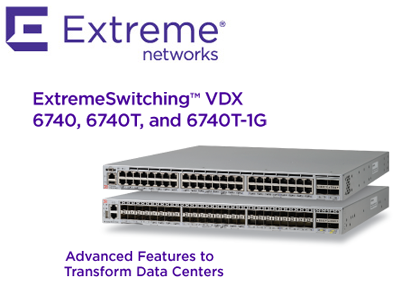 Extreme VDX 6740 Top of Rack (ToR) switches support 1/10/40 GbE ports—enabling the efficiency and flexibility you need to support cloud computing, virtualization, mobility, and consolidation.